Zhukovsky, July 20. / TASS /. Work on the creation of the corrected bombs KAB-250 is planned to be completed by the end of the year. On Thursday the CEO of the Corporation "Tactical Missiles" (Tactical Missiles Corporation) Boris Obnosov. "Presented corrected air bombs KAB-250 with laser seeker ... I hope that before the end of the year we will work on this product will end", - he said at the MAKS-2017. Adjustable aerial bomb with laser homing and high-explosive fragmentation warhead CC-250 designed to engage various equipment, fortifications, warehouses, and other infrastructure elements enemy targets. Through the use of laser-guided bomb system has a high hit accuracy. Portages also said that a rocket with artificial intelligence elements will appear in Russia in a few years. "We have seen an example of this, and when the Americans used in Syria ... when you can redirect (rocket - TASS approx.) For the purposes in this direction are carried out, it is very serious applications requiring basic research To date some success there.. but to specifics, we still run for a few years ", - said Obnosov, when asked about the creation of missiles with elements of artificial intelligence. Earlier, Viktor Bondarev, who was then President of Air Force Commander, said that the Russian aircraft will have cruise missiles with elements of artificial intelligence, which will analyze the air and radar situation and make their own decision, at what height, what speed and in what direction they fly. The general director also said that the Tactical Missiles Corporation is planning by 2020 to create a high-precision cruise missile with a range of 1000 km and an accuracy of a few meters. "In this direction a new line of products is carried out, there are up to 200, to 400, to 600, up to 1000 km items therefore work in this direction are carried out I think until 2020 exactly with this line (rockets) on the right.." - Obnosov said, answering the question of the establishment of the Russian analogue of the US high-precision cruise missile long-range Jassm. According to him, it is impossible to cover all one missile target. "In some cases, inefficient cover a large range of" - explained the CEO of Tactical Missiles Corporation need to create an entire line of missiles. US high-precision cruise missile JASSM is designed to engage a well-protected fixed and relocatable targets in any weather and at any time of the day, with distances outside the range of enemy air defenses. Its range - 370 km (JASSM-ER 1000 km). The rocket is capable to deliver the warhead weight of 450 kg. Hypersonic drones will appear in Russia in 2020, Obnosov said. "The second direction - when there is a long-term management of the flight at hypersonic speeds solve this problem even at low hypersonic velocities in the six or seven strides very difficult I think that in 2020 it is still is a serious development of hypersonic speeds in terms of unmanned aerial vehicles.. ", - he said. Portages also noted that "the work in this direction is, in engines is a serious work, Materials, Systems'. He also admitted that the complications too, because it is "serious development". 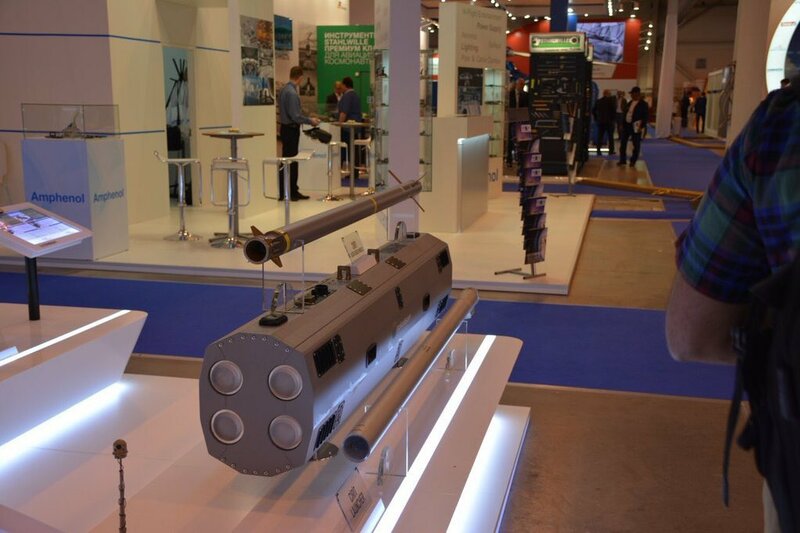 Modernization of high-speed underwater missile "Flurry"
Work on the modernization of high-speed underwater missile "Flurry" underway in Russia, they are included in the new state program of armaments in the years 2018-2025, said Obnosov. "Work in this direction is underway, I think the parameters will be seriously improved", - he said. "Yes," - also said Obnosov, answering the question, whether these are included in the work of the new state program of armaments in 2018-2025 years. weapons complex with a high-speed underwater missile "Squall-E" is designed to engage surface targets. The complex can be disposed on the surface ships, submarines or on stationary installations. 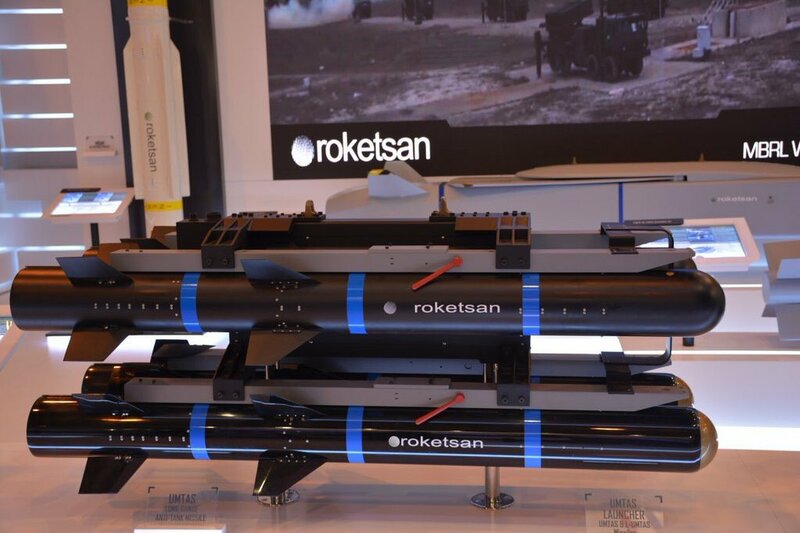 The effective shooting distance is seven kilometers away, underwater launch depth is 30 meters, the weight of the missile - 210 kilograms, caliber - 534.4 mm, length - 8.2 meters, weight - 2700 kg. Zhukovsky. July 20. Interfax - New radar station (RLS) are developed in Russia for a national system of air and missile defense (air and missile defense), told "Interfax" on Thursday, the head of the Defense Council of the holding "RTI" Directors, Chief Designer Warning System (EWS), Sergei fighting. "This will not only radar type" Voronezh "It will be a number of new advanced radar, we are working they are now -.. At the stage of development and design The characteristics of these products -. A new step forward", - said S. fighting agency at MAKS-2017, responding to a question about the national system of air and missile defense. "We are well aware that everything we do in this area - it is part of a larger work, which today sells" EKO Concern "Almaz-Antey". He is in this work is a leader, "- said S.Boev, which is part of the Board of Directors of JSC" Concern EKR "Almaz-Antey". According S.Boeva, national system of air and missile defense would be a response to the new threats in the field of aerospace defense. In June, in an interview with "Parliamentary newspaper" S.Boev said that the national air and missile defense system will be established by 2025. "It is expected that by 2020, will be the modernization of the defense system A-135 of the city of Moscow and the Central Industrial Region, and complete the creation of a national missile defense system by 2025", - he said then S.Boev. According to him, layered missile defense system is created on the basis of long-range interception missile complexes, anti-aircraft missile systems, air defense missile and modernized missile systems near interception. The basis of a single national air and missile defense system will be an anti-aircraft missile system (SAM), S-500, said the commander of the anti-missile defense of the First Army air and missile defense aerospace forces, Major General Andrew Cheburin in January in an interview with the Russian Defense Ministry newspaper "Red Star". The development perspective of S-500 is the JSC "Concern EKR" Almaz-Antey "This new generation of air defense systems." Surface to Air "- a universal set of long-range and high-altitude interception with increased missile defense potential. OJSC" RTI "(included in the AFC" system "), in particular, develops radar (RLS)" Voronezh. "This Russian-horizon radar ground tier EWS operating in different bands of radio waves. radars capable of detecting the space, ballistic and aerodynamic objects. The Russian army will receive anti-aircraft missile system S-500 in 2020 - EKR Concern "Almaz-Antey"
Zhukovsky (Moscow region). July 20. Interfax-AVN - Work on the latest anti-aircraft missile system (SAM) is on schedule, he told journalists during the exhibition MAKS-2017, Deputy Director General of concern EKR (Aerospace Defense) "Almaz-Antey" on external economic activity Vyacheslav Dzirkaln. "According to the plan, the transmission system is scheduled for 2020," - he said. According to him, "at the present time, some elements of the new S-500 successfully passed the bulk of the tests." "Ends the test anti-aircraft guided interceptor missile designed to intercept targets in the upper layers of the atmosphere", - he said. "In general, the work is going according to the schedule agreed upon with the customer - the Ministry of Defense of the Russian Federation", - said V.Dzirkaln. Earlier, Deputy Prime Minister Dmitry Rogozin in an interview to "Interfax-AVN" reported that the developed EKO concern "Almaz-Antey" S-500 will have a greater range and efficiency. "From previous air defense systems S-500 will be different range and defeat the effectiveness of any aerodynamic and ballistic targets," - he said. Prospective S-500 is a new generation air defense systems "surface-to-air" and is a universal set of long-range and high-altitude interception with increased missile defense potential. 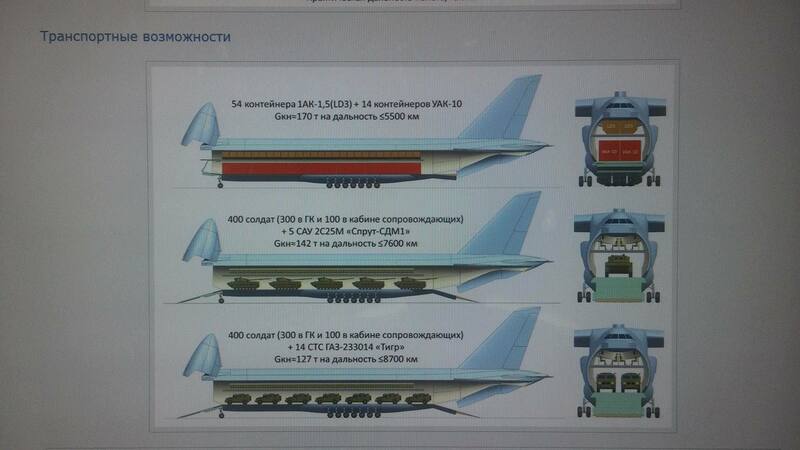 C-500 will be the foundation created in Russia a unified national system of air and missile defense (AD-PRO). According to its basic characteristics it exceeds the foreign analogues, which are either already exist or are created. State tests an anti-aircraft missile system "Hero" will be completed this year - EKR concern "Almaz-Antey"
Zhukovsky (Moscow region). July 20. Interfax-AVN - State tests of the newest anti-aircraft missile system (SAM) C-350 "Hero" is scheduled for completion in 2017, Deputy Director General of concern EKR (Aerospace Defense) "Almaz-Antey" on external economic activity Vyacheslav Dzirkaln. "In 2017, the completed state testing system," - said V.Dzirkaln reporters on Thursday held in Zhukovsky air show MAKS-2017. "Now the concern specialists gaining Statistics martial launches to intercept real targets in different conditions," - said V.Dzirkaln. "Also, we will soon conclude the state testing of three new surface-to-air missile with an active homing head for equipping the S-350" Hero "and maritime air defense systems", - he said. Earlier it was reported that the S-350 "Hero" is designed to solve the problems of struggle, first of all, with massive air and space attack - cruise missiles, manned aircraft, drones medium and heavy class, tactical ballistic missiles. A feature of this system is that it has the ability to review and shelling targets in circular mode, and not only in a sector, as in "trehsotki". The second feature is that the new SAM significantly increased channel of simultaneously engaged targets and self-adapting missiles. Anti-aircraft missiles to advanced systems "Poliment-Redoute" and "Hero" will be unified - EKR concern "Almaz-Antey"
Zhukovsky (Moscow region). July 20. Interfax-AVN - anti-aircraft missile system (ADMS) "Poliment-Redoute" for the Russian Navy ships and anti-aircraft missile system (SAM) C-350 "Hero" will use three types of the same missile, deputy director general of the group of EKR (Aerospace Defense ) "Almaz-Antey" on external economic activity Vyacheslav Dzirkaln. "SAM" Poliment-Redoute "provides for three types of missiles:.. Small, medium and intermediate-range missiles, which are currently undergoing successful trials These missiles are a new generation of missiles with a very high maneuverability characteristics to hit the whole spectrum of attacking objects These missiles are unified with the S -350 "Hero", - he said V.Dzirkaln reporters on Thursday held in Zhukovsky air show MAKS-2017. According to him, "today a full-scale air defense system" Poliment-Redoute "deployed at the head of the Navy frigate" Admiral Gorshkov "
"There are also a few corvettes with launchers, locational facilities and systems management from the sea this complex," - he said. Earlier it was reported that all missiles of new generation created with active homing with inertial control systems and have very good maneuvering characteristics for the defeat of the entire spectrum of attacking objects. Zhukovsky (Moscow region). July 20. Interfax-AVN - Concern Aerospace Defense (ASD) "Almaz-Antey" pays great attention to service previously supplied the Defense Ministry arms, told reporters on Thursday the head of Jan Novikov enterprise. "At the end of 2017 in the field of service, we look forward to further enhancing the effectiveness of service systems in particular, through the creation of eight regional service centers on the basis of three production and technical enterprises and five repair plants." - Ya.Novikov said. According to him, in 2016 the total volume of orders generated from the integrated structure of the Group concluded with the Russian law-enforcement agencies of contracts exceeded the 2015 portfolio by almost 10%. Figure for the volume delivered within the State defense order of services for 2016 exceeded by 15% the same period in 2015 and amounted to more than 50% of the total volume of services provided in the past three years. Number held in 2016 overhauls is 1.3 times higher than the same period in 2015 and amounted to 42% of the total volume of capital repairs for the past three years. The reliability of the new center of the Moscow organization of air traffic documented - EKR concern "Almaz-Antey"
Zhukovsky (Moscow region). July 20. Interfax-AVN - Vnukovo completed the construction of the Moscow center of the enlarged air traffic management (ATM), Deputy Director General of concern EKR (Aerospace Defense) "Almaz-Antey" on external economic activity Vyacheslav Dzirkaln. "Putting it into operation is the responsibility of the customer - the Federal State Unitary Enterprise." State ATM Corporation "whole cycle of acceptance tests, including repeated, took place in the period from August 2015 on December 2016 been documented reliability and efficiency of the new ATM automated system of Moscow. center, as well as compliance with the customer's specifications, "- said V.Dzirkaln reporters Thursday at MAKS-2017. "We hope that the acceptance of the Center's operation will occur in the near future and thus will increase the capacity of the Moscow airports and ensure the safety of flights," - said V.Dzirkaln. Earlier it was reported that a new automated ATM system has no analogues in the world. 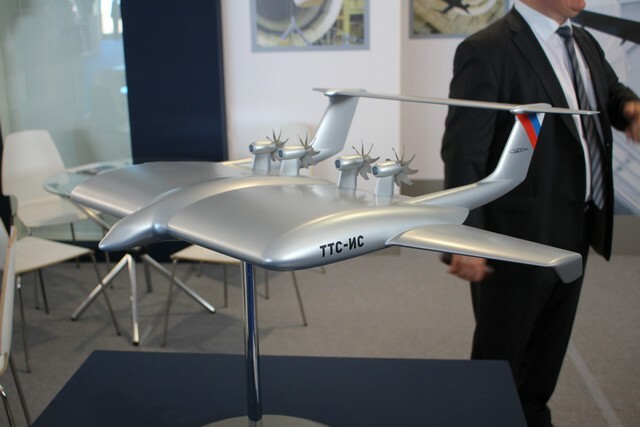 It allows optimal to change the structure of the airspace over Moscow. It implements technological solutions that solved the problem by creating a single mission control center in Moscow and the Moscow area of the EU ATM area. Concern EKR "Almaz-Antey" - the basic manufacturer and system integrator of the Russian Federation of the ATM system. Concern has created the conditions for maximum safety and efficiency of the use of airspace during the APEC summit in Vladivostok, the World Summer Universiade in Kazan and the Olympic Games in Sochi. Zhukovsky (Moscow region). July 20. Interfax-AVN - The Concern Aerospace Defense (ASD) "Almaz-Antey" is developed and after consultation with the Ministry of Industry and the Ministry of Defense approved a number of replacement components schedules of NATO and the EU, told reporters on Thursday the head of Jan Novikov enterprise. "Today, we are implementing measures on import of components from some 30 countries", - he said. "C in order to reduce the risk of failure of the assignment of the state defense order and military-technical cooperation in the concern generated safety stock of components for the period up to 2020", - said Ya.Novikov. JohninMK wrote: Amazing Su-35 display in embedded video. Not sure how an incoming AAM would track that. Unless you have another angle of the same video, for me it will be a fake. That's just against gravity and law physics !! Looks more like an rc Model of the su-35 with the sound of the Su-35 taken from another video. In my book, lightweight fighter should be Yak, medium fighter should be MiG and heavy one should be Su. ZHUKOVSKY, July 20. /TASS/. Russia will develop a family of air-launched precision cruise missiles before 2020 that will be capable of striking targets at a distance of up to 1,000 kilometers, Tactical Missiles Corporation CEO Boris Obnosov said on Thursday. "Work is under way on a new family of items with a range of 200km, 400km, 600km and 1,000km. That is why, work in this area is being carried out. I believe that before 2020 we’ll surely roll out this family of items [missiles]," Obnosov said at the MAKS-2017 airshow, responding to a question about whether Russia was developing the analog of the US JASSM high precision long-range cruise missile. As the Tactical Missiles Corporation head said, one missile can’t engage all the targets. "In some cases, it is inefficient to cover a longer range," he said, explaining the need to develop a whole family of missiles. The US JASSM high precision cruise missile is intended to strike well-protected stationary and relocatable targets in any weather conditions and at any time of the day from distances off the enemy’s air defenses’ reach. It has a radius of operation of 370 km (JASSM-ER has an operational radius of up to 1,000 km). The missile is capable of delivering 450kg warheads. During the Moscow Aviation and Space Salon MAKS-2017, a number of interesting concepts of promising aircraft were presented. 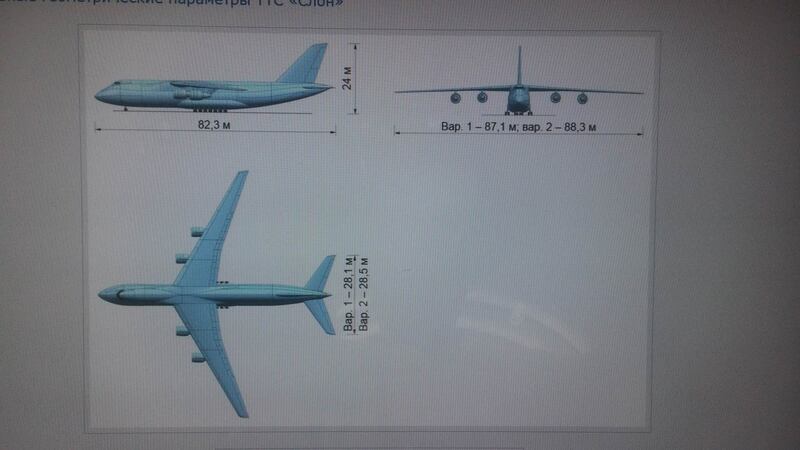 One of them could be seen in the presentation of the Central Aerohydrodynamic Institute named after Professor NE Zhukovsky (TsAGI) presented the concept of a prospective heavy transport aircraft (TTS), which should replace the existing An-124 Ruslan. The project was named "Elephant". 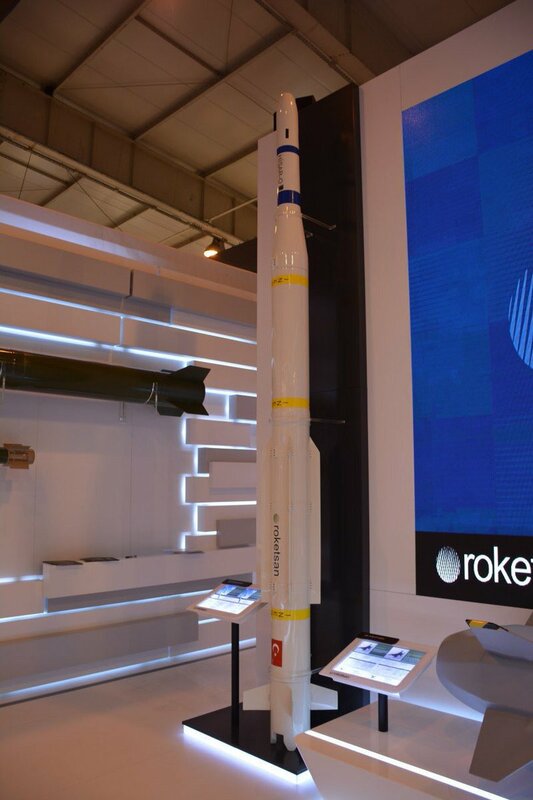 Roketsan attended The International Aerospace Exhibition MAKS held in Zhukovsky Russia on July 18-23. So what were the results? So far, from what I read, nearly nothing. Some SSJ here, MS-21 there and a few helicopters. Kinda sad from poor results of this years maks. Not even any military plane orders from MoD. miketheterrible wrote: So what were the results? So far, from what I read, nearly nothing. Some SSJ here, MS-21 there and a few helicopters. Kinda sad from poor results of this years maks. Not even any military plane orders from MoD. Algeria expressed the intention to acquire at least a Su-32 squadron, which is an export version of the Su-34 front-line bomber, and is intended to replace Su-24MK bombers. Participants of the Algerian delegation were able to inspect the Su-34 and get information about its characteristics. The problem is, Russian developers keep saying "they expressed interest" with 0 follow up years later. Most notorious is the India deals. While India will purchase right then and there with US, it takes them decades to deal with Russia, even for a screw. Same goes for "UAE shows interest". I'm talking of hard numbers of actual sale contracts. The perspective Russian PD-12V engine will improve flight characteristics of Mi-26 transport helicopter, the United Aircraft Corporation told TASS at the MAKS-2017 air show. "We assess that Mi-26 upgrade with PD-12V engine will improve the flight characteristics of the helicopter and, in particular, the altitude capability," it said. 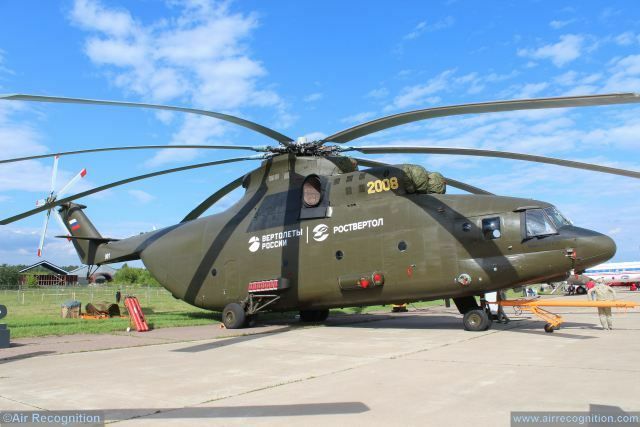 The corporation said "R&D to create PD-12V for Mi-26 helicopter on the basis of gas generator of the basic PD-14 engine is currently ongoing. It is created on a new technological basis with new materials and improved specific characteristics." PD-12V is designed to replace Ukrainian-made D-436 engines which Mi-26 helicopters are currently equipped with. The UDC earlier said the gas generator of PD-14 is used to develop 35-ton thrust engine for perspective Russian heavy airlifter Il-106. The Ilyushin Company is also considering installing the perspective PD-35 on the wide-body Il-96 aircraft to reduce the number of engines from four to two. The Russian Helicopters holding is exhibiting a new variant of the Mi-171Sh utility helicopter reconfigured for special operations and designated Mi-171Sh-VN. The helicopter was unveiled at the MAKS 2017 airshow at Zhukovsky outside Moscow. The Mi-171Sh-VN features combat effectiveness and survivability enhanced over the basic model. "The helicopter`s concept has been developed considering the combat experience including the one got in Syria," the CEO of Russian Helicopters Andrey Boginsky said. The helicopter will be promoted on the global market under Mi-171Sh designation. 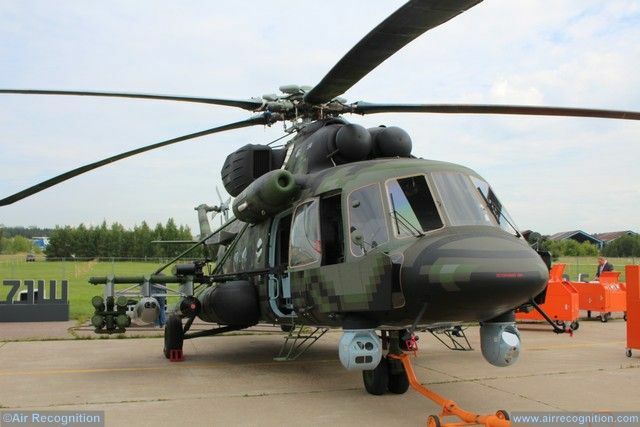 According to the official specifications, the Mi-171Sh-VN has a maximum take-off weight (MTOW) of 13,500 kg, a maximum payload of 4,000 kg, a ferry range of 1,065 km, a service ceiling of 6,000 m, a maximum speed of 280 km/h and a cruise speed of 260 km/h. The aircraft has a crew of three and can transport up to 37 dismounts. The Mi-171Sh-VN is powered by two engines with a power output of 1,900 hp each. It has also received composite main rotor blades and an X-type tail rotor. The Mi-171Sh-VN gunship has received a powerful armament suite. 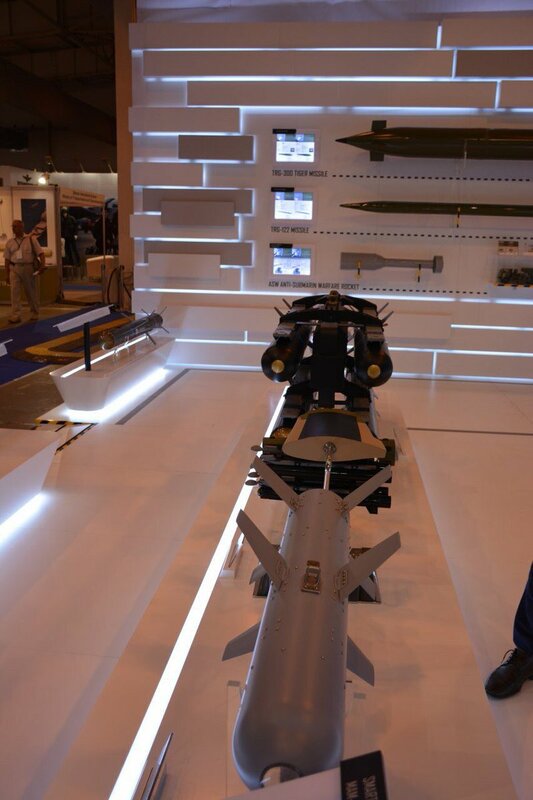 The aircraft exhibited at MAKS 2017 is armed with eight Ataka guided missiles, two UPK-23-250 gun pods with GSh-23 twin-barrel automatic cannons, two S-8 rocket launchers, two OFAB-250 aerial bombs and two upperwing-fixed 12.7 mm Kord heavy machineguns. The helicopter can be also fitted with two more Kords in door mounts. A pinpoint mount for a 7.62 mm PKM medium machinegun is installed in the rear part. The helicopter’s protection has been reinforced with applique spall liner made of kevlar fabric and anti-blast seats for dismounts. The Mi-171Sh-VN has received two chin-mounted hyrostabilised platforms for optoelectronic systems. The helicopter is equipped with a FLIR system, an infrared searchlight and a glass cockpit suitable for night vision googles. The Mi-171Sh-VN features pixel camouflage painting scheme that drastically reduces its visual signature. The Zhukovsky Central AeroHydrodynamic Institute (TsAGI, a member of the National Research Center “Institute named after N.E.Zhukovsky”) is demonstrating the results of its scientific and experimental research at the MAKS airshow. 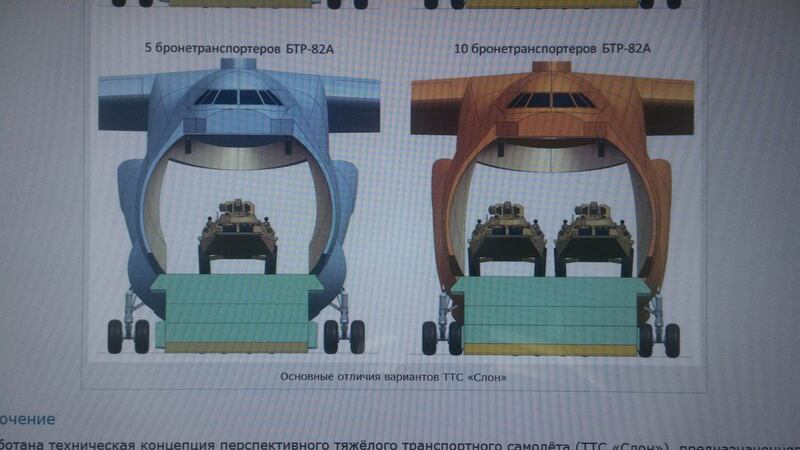 Among others concepts is a mock-up of its "Heavy Cargo Aircraft Lifting Body" (HCA-LB) unveiled in January 2017.